Annette and Dent see the ability of their DME Unit to free people from the dirty drudgery of copra production. Copra production is hard, hot, poorly paid work. Annette Soma is a strong, dignified, big-hearted Solomon Island woman, a chief of her people in the village of Verahue, West Guadalcanal where she has supposedly “retired”. 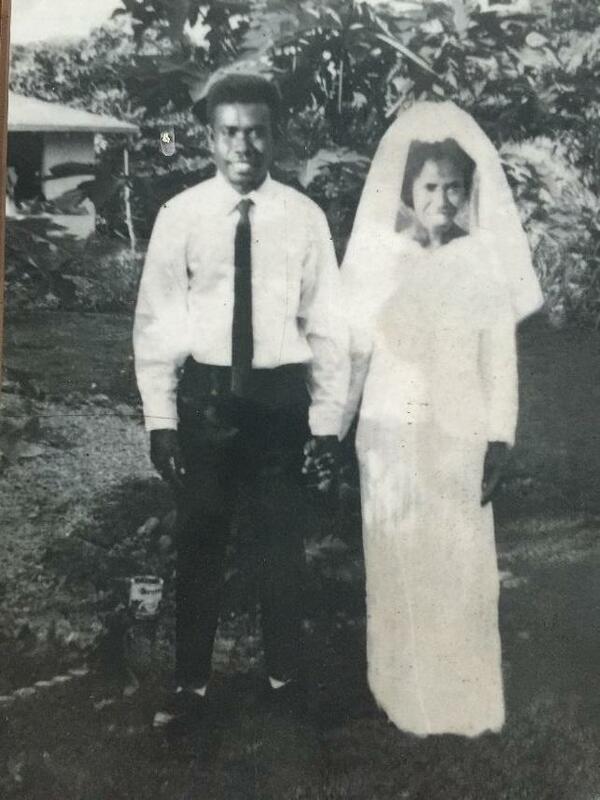 She worked hard for 30 years as a nurse and her husband Dent as an accountant in the capital Honiara for 30 years. 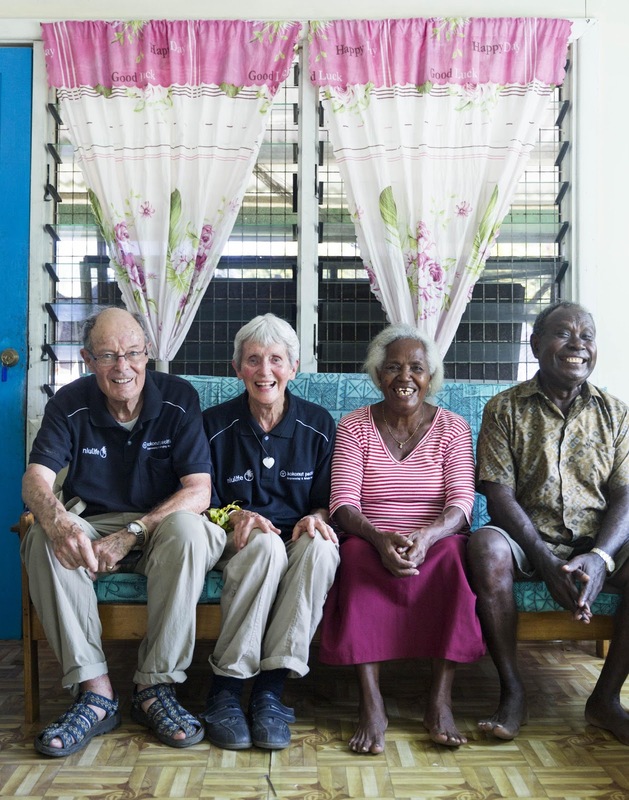 They also raised four children who are now working, one as a lawyer, another as a doctor, one in the Australian High Commission and one is following in mum’s footsteps, working in community health. Dent and Annette now live in her family’s village where they run the Verahue DME unit, a shop and a guest house! They are also called on to settle community disputes and are active in the local church fellowship. Pictured: Dent and Annette Soma on their wedding day more than 30 years ago, a big event that was celebrated with a 14 pig feast! In the village their home is exceptional, with running water, three solar powered lights and a flushing toilet. They are proud to show us the new gas fridge they have bought for the shop and the generator which provides power at night for the community hall and Church. But Annette says she wasn’t always hard working! “When I was a girl my Uncle chided me, saying “Never be lazy!” and he cut my hair off so I would remember,” says Annette. It was a lesson she never forgot. She is now a leader of her people, in a matriarchal society, and in “retirement” she is busier than ever. More than anything else, Annette and Dent see the ability of their DME Unit to free people from the dirty drudgery of copra production. It is hard, hot, poorly paid work. The Somas applied for and were granted a Rural Development grant to construct and pay for the DME unit. They supplied the timber to build the facility. In comparison to copra, DME is easier and makes better money for everyone involved. At the Verahue DME over 1000 nuts are bought every day from 26 certified organic coconut growing farms to produce 60 litres of oil a day. This provides a massive cash injection into the community and spreads the cash evenly amongst the people. This is an important cultural requirement in communities with a strong emphasis on sharing and generosity. 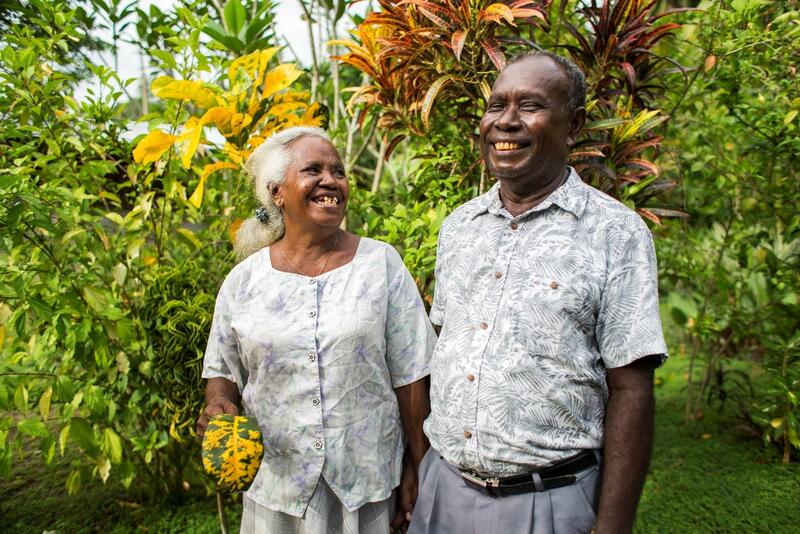 Not only do coconut farming families benefit, but Dent and Annette employ 14 people a day in two shifts to operate the DME Unit. The left-over press cake goes to some very happy pigs, housed in their own thatched enclosure next to the beach. Pigs are highly valued. Dent and Annette recall fondly their 14 pig wedding feast! The village is filled with smiling, happy well-nourished children. However, these children are also a sign of the population growth, which is set to double in the Solomons in the next 20 years. It’s unclear where the next generation will find meaningful work. Education is a major issue, most are illiterate. The coconut, called the “tree of life,” is a bountiful, pre-existing resource in West Guadalcanal. It produces a bunch of coconuts every month for over 60 years, its life cycle closely resembling that of a human lifespan. Tapping its abundant bounty provides new life for the village people, who currently live a basic but adequate affluent subsistence around farming, fishing, family and of course, football. Currently, when village people need cash, they produce and sell copra. Copra is hard, dirty, hot and poorly paid work. Often men take the copra to town only to return empty handed, the money being spent on transport and other town temptations. The impact is felt most by women and children. There is a copra dryer in every village. When copra prices are good, copra is made and people have a little money for daily necessities. When prices are bad, people go without, or work for low returns. The returns from DME oil that are being value added in the village are worth many times more than making copra. Also the DME Mill pays both the local coconut growers and the oil production employees, thus spreading funds evenly through the community. And the money doesn’t go to town. The work is clean, pleasant and enjoyable, and most importantly, gender neutral. Women work alongside the men and each person is paid their due. This gets money into the hands of women who tend to spend it on improving their family’s lives. The funds from the DME unit at Verahue are being used to build a kindergarten. Land has already been cleared in preparation for construction. She and her husband worked hard to educate their own children. Now they are looking to help the village children and get them started with a good education. This is the oil that changes lives, and you make it possible.